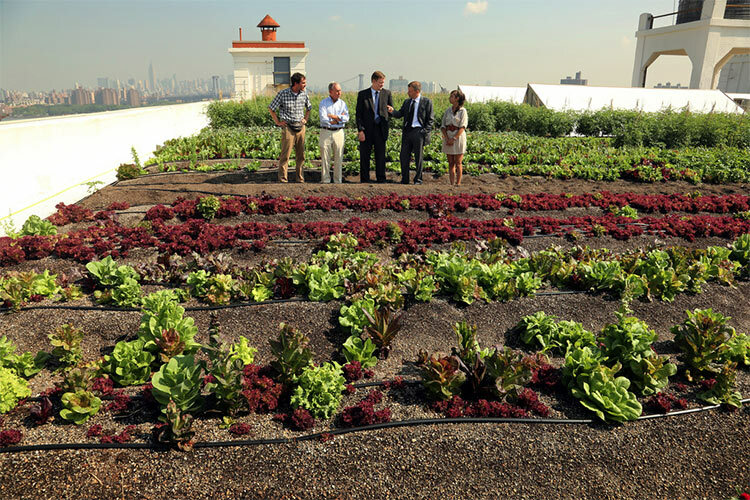 Urban rooftop farming is on the up-and-up in New York City and across the country. Putting his official stamp of approval on the movement, New York Mayor Bloomberg stopped by the city’s largest rooftop farm, the 43,000-square-foot Brooklyn Grange atop a building in the Brooklyn Navy Yard. 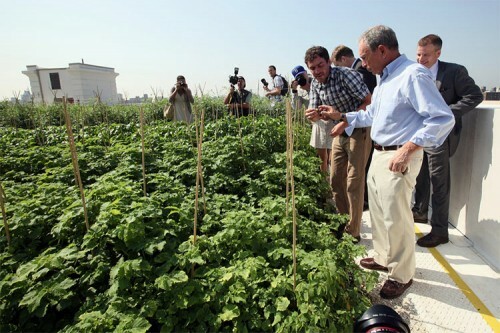 With the growing season in full swing, the plants were towering nearly as high as the Manhattan skyline in the distance. The new facility is the second site for Brooklyn Grange, a commercial farming operation that also operates a rooftop in Long Island City, Queens. The new farm was awarded nearly $600,000 from the Department of Environmental Protection’s Green Infrastructure Grant Program, the largest project in the program to date, as it’s expected to help defer stormwater runoff and improve water quality. In fact, it’s expected that the farm will store more than one million gallons of rainwater every year. That will help keep the city’s sewer system from being overwhelmed during storms, which causes combined sewer overflow (CSO) sending sewage directly into New York Harbor. The farm will grow salad greens, chard, kale, basil, eggplant, cucumbers, and ground cherries, and Brooklyn Grange hopes to harvest around 20,000 pounds of produce a year.